Used ATV 4 Wheelers - Top Buying Tips. How do you find good used ATV 4 Wheelers? Which used ATVs are the Best Buys? How do you get the most for your money? We answer those questions and more in this exclusive report. Just keep reading - that's the first step! Top 3 Tips About Used ATV 4 Wheelers. 1. Simple ATVs are more reliable than complicated ATVs. More gizmos and gimmicks mean more things to go wrong as the miles roll up. A top line used four wheeler is tempting - but are you willing to risk all the potentially expensive repairs? Basic models just have less to go wrong. Used 4 Wheelers ridden like this are not what you want! Sophisticated electronics aren't usually at their best in the harsh environment that most ATVs operate in. So computers and sensors for all the new hi-tech stuff like EFI, EPS, electronic shifting, etc. really get put to the test. Stone simple ATVs may not wow all your buddies, but chances are you'll still be riding when their expensive new toys are hooked up to a diagnostic machine, trying to figure out what's wrong. 2. The first year of a new models tends to be less reliable. There always seems to be teething problems with the first run of a new model. Unexpected problems come up that pre production testing missed. New features may not work as planned. All that stuff is usually fixed in the second year along with some minor upgrades. The Suzuki Z400 is a good example - The new for 2004 model had several problems. The 2005 model had fixes for most of them and added a reverse gear among other upgrades. 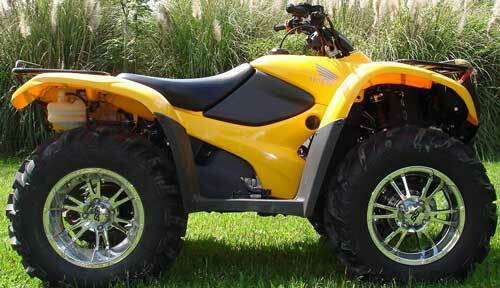 As used ATV 4 wheelers today, there's very little difference in price - which makes the 2005 model the one to have. Another example is the Polaris RZR. This was a whole new type of side by side for riding on regulated 50" wide trails. For the most part, they worked great, but suffered from several annoying problems. New owners just had to live with them. Now the current 2012 models have corrected all those early complaints, and new owners can just go out and enjoy the ride. 3. New technology is normally less reliable. Same principle as tip number 2. No amount of testing can simulate the real world where ATVs are ridden every day. Owners do things with their 4 wheelers that the factories probably never dreamed of! It's those kind of situations that reveal problems with new features that the manufacturers just didn't expect. If you're thinking about buying a used ATV 4 wheeler that introduced something new - just do your homework to make sure it's been reliable over a period of time - and not a constant source of breakdowns. An example is Can Am's speed sensitive electric power steering system that was heralded as a technological break through when it was introduced. But almost as soon as the new models hit the showroom floor, Can Am had to issue a recall for the steering units. More Buying Tips for Used ATV 4 Wheelers. A used ATV in showroom new condition is what you really want. Condition, condition, and condition! - Forget mileage, year model, cheap price, etc. It's all about what kind of shape your future quad is in. When you start buying replacement parts that cheap initial price won't mean a thing! Is it clean? - If they were too lazy to give it a good cleaning when it's for sale - just imagine how it was treated normally! We don't mean just a trip to the car wash clean. Take a flash light and look into all the nooks and crannies for signs of residual mud and dirt that a car wash misses. That will tell a lot more about how it was ridden. Is it straight? - Look for bent or dented bumpers and racks indicating crashes or roll overs. Bent bars and levers are another tell tale sign. Be sure to look at the bottom of the frame for damage. Check the wheel rims for dents and dings. This could all add up to a history of hard riding, rock bashing, crashes, etc. Is it pretty? - Say what? Yeah that's right. What we mean is how does it look? Like a desert UV experiment gone wrong - or something that would look at home on a showroom floor. Guess which is best. The point we're trying to make is that the condition of a used atv 4 wheeler says a lot. It's really hard to hide a history of abuse with detailing. 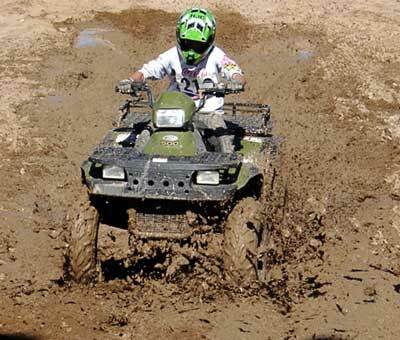 Even the used quads we recommend won't be good buys if they have been abused and poorly maintained. There are better ones to be found. Tip for getting the most 4 Wheeler for your money. Get more value with included accessories. 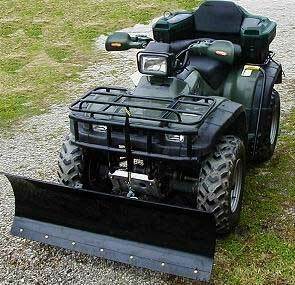 A nice thing about used ATV 4 wheelers is that most owners have added accessories to them. Fortunately for you, seller's are usually willing to let these go with the four wheeler for very little, if any, extra cost. Along that same line, if the 4 wheeler does have non-stock equipment like wheels/tires, exhaust system, etc., be sure to ask if the seller still has the stock items. They'll usually throw those in just to make the sale. This is the best time to try to get all the equipment you can. Once you're gone and the deal is done, it's too late! So to sum it up, our recommendation is to look for a more basic ATV model that's not a new release, and doesn't come with some unproven new technology. Then it's time for due diligence to scope out the true condition of the ATV. Take your time and be thorough. And last, negotiate for the best deal possible by getting all the equipment the seller is willing to part with. Follow these guidelines, and you'll end up with a used ATV that will give you years of good riding, and with reasonable care, will retain most of it's original value. Top Used ATV 4 Wheelers - Four Wheel Drive Models.